Soon there was political unrest. The unhappiest sectors of the Mexican society were the peasants and labor workers. To defend these two popular sectors, Ricardo Flores Magón founded the Mexican Liberal Party. Flores Magón was obviously persecuted by the Porfirist regime, and died in an American prison. In 1906 the army brutally repressed a strike of miners in the Cananea mine in Sonora. As you can see, Díaz did every thing in his power to crush any uprisings. 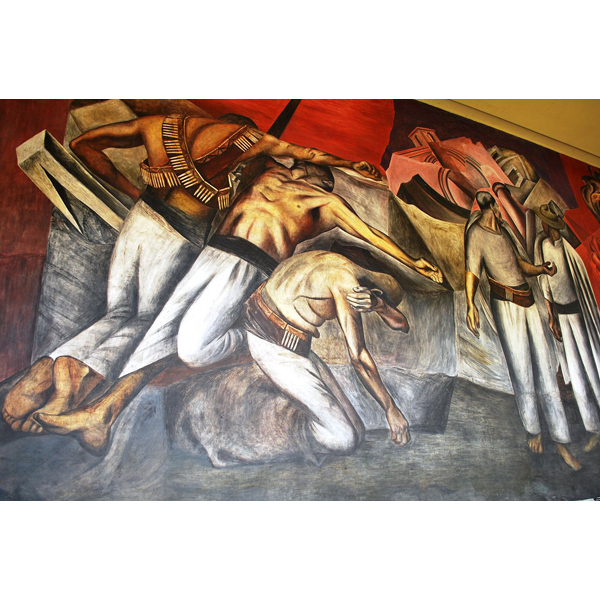 The Cananea massacre is historically considered the spark that finally ignited Mexico’s Revolution. “I have waited patiently for the day to come when the citizens of the Mexican Republic will be prepared to elect and decide their Government at every election without the danger of armed revolutions and without injury to the national credit or interference with national progress. In early 1909 Francisco I. Madero founded the Anti Reelectionist Party. Madero came from a wealthy family from Coahuila. He had studied business in France as well as in the U.S. He vigorously fought against reelection and for democracy and liberty in Mexico through his political newspaper articles. The Anti Reelectionist party designated him to run for President in the elections of 1910. Díaz was now under constant pressure, and on June 6th he ordered the imprisonment of Madero, augmenting that he was “inciting rebellion and offending the authorities”. Francisco I. Madero was taken to a prison in San Luis Potosí, where he awaited the results of the elections. There he learned that through an electoral fraud Díaz declared himself President of Mexico one more time! Then and there Madero, who had always been a pacifist, decided to flee from prison and call for a National Insurrection on November 20 1910. He declared the electoral process invalid and appointed provisional Governors. Immediately, uprising broke out in several Mexican states. The first were Puebla, Coahuila, Chihuahua and Sonora. Ciudad Juárez, Chihuahua, was taken by the insurrectors: Pascual Orozco and Francisco “Pancho” Villa. When the city surrendered Madero set up his provisional government there. Díaz was then forced to resign and had to abandon the country. Some of the most important Revolutionaries were Pascual Orozco, Francisco Villa in the northern states, and Emiliano Zapata in the south. New elections took place in 1911, and Madero was elected President of Mexico. Unfortunately, peace was not to come to this country for a while. Several Revolutionary leaders couldn’t settle their differences. Madero wanted to work steadily and patiently towards bettering the economic and social situation. But many revolutionary commanders wanted immediate change, which was impossible to accomplish. Pascual Orozco,for example, led and lost a revolt against Madero. Three Porfirist generals also attacked President Madero, who in turn, appointed Victoriano Huerta to repress the offensive. A fatal decision…. In time history would prove that Victoriano Huerta was the utmost traitor of the Revolution.Francisco I. Madero was captured and assassinated by Huerta’s accomplices. The vice-president and a brother of Madero were also killed. Huerta’s victory would be short-lived. A new Revolutionary movement emerged with unprecedented force; it was called the Constitutionalist Movement. Huerta had to flee the country in 1914. In 1917 the Constitution was reformed. Fighting among revolutionary groups did not end until 1920. The Revolution had at last triumphed!